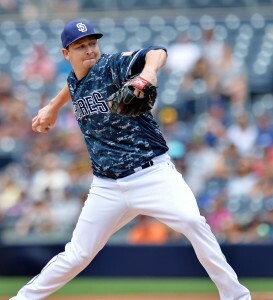 The Angels have added their second starting pitcher of the week, announcing on Thursday that they’ve signed righty Trevor Cahill to a one-year contract for the 2019 season. Cahill, a client of John Boggs & Associates, will reportedly earn a $9MM base salary and can secure an additional $1.5MM via an incentives package. Specifically, the deal is said to pay him $250K for reaching each of 100, 110, 120 and 130 innings, and he’d notch another $500K upon reaching 170 innings. He’d also reportedly land a $250K assignment bonus in the event that he’s traded. Cahill will now join the also recently signed Matt Harvey as a rental starter in Anaheim. That seems to be a good outcome for the team, which will promise the pair a combined $20MM without extending its obligations past the 2019 season. Entering the winter, MLBTR predicted that both Cahill and Harvey would command two-year, $22MM contracts. While the early returns on the rotation market were relatively promising, the more recent market markers have been suboptimal from the players’ perspective, with several hurlers securing less years than might have been anticipated. Cahill, who’ll open the 2019 season at 31 years of age, has certainly not been the steadiest option in recent years, but he has shown some fascinating skills. Since returning to the rotation following a bounceback 2016 in a relief capacity, Cahill has struck out nearly a batter per inning while drawing grounders near his career 55.0% rate. Outside of some late-’17 struggles, Cahill has been quite productive of late. He ended up giving the A’s 110 innings of 3.76 ERA ball last year, with peripherals to match — including a career-high 11.7% swinging-strike rate. Of course, DL stints again left cause for concern, which surely hurt Cahill’s bid for multiple seasons in free agency. It’s certainly possible to look at the Angels rotation mix now and imagine a solid, cost-efficient unit. Andrew Heaney and Tyler Skaggs both showed well last year, while Jaime Barria and Felix Pena established themselves as solid options as well. Nick Tropeano is still around and will hope for a bounce back after some struggles upon returning from Tommy John surgery. JC Ramirez could return from the same procedure at some point. Luke Farrell, Miguel Almonte, and Dillon Peters represent depth pieces. That said, it’s tough to see that as a high-grade unit even in the most optimistic of scenarios. And all of the team’s most-accomplished starters come with major recent health issues, including the two newest acquisitions. In a sense, it’s a continuation of last year’s approach of hoping to get enough innings from enough worthwhile pitchers to add up to a quality overall staff. It didn’t really work out in the aggregate. And now the highest-upside pieces are gone, with Garrett Richards and Matt Shoemaker out of the organization and Shohei Ohtani getting comfortable with a new ulnar collateral ligament. The Halos reportedly pursued more notable targets, reportedly falling short in bids for both Patrick Corbin and Nathan Eovaldi earlier this winter. It’s still possible the club will continue angling for other arms, with Dallas Keuchel available in free agency and a few potential notable trade candidates, but it could also be that the club is now done with its rotation-building efforts. If that’s the case, then perhaps GM Billy Eppler will turn to other avenues to improve. The bullpen, catching unit, and position-player bench mix could all stand to be improved. Perhaps it’s not out of the question to imagine a surprise run at a high-level bat, though we’ve seen no real indication of that to this point. Ken Rosenthal of The Athletic first reported the agreement and the terms (via Twitter). Mark Feinsand of MLB.com and Jon Heyman of Fancred added details on the incentives and assignment bonus (Twitter links). 1:15pm: Cahill is expected only to be out for the required ten days, skipper Bob Melvin tells reporters including MLB.com’s Jane Lee (via Twitter). It is obviously not seen as a significant injury. 10:41am: The Athletics have announced the promotion of outfielder Dustin Fowler. He’ll take the open roster spot created by the placement of righty Trevor Cahill on the 10-day DL. Fowler, acquired in last summer’s Sonny Gray trade, will be back in the majors after his first stint ended in calamity with a ruptured patella tendon in his very first game. The 23-year-old has been at full strength this year at Triple-A, where he has recorded a .313/.333/.484 batting line in 132 plate appearances. It is not fully clear at the moment whether Fowler will get an extended look, as the A’s will ultimately need to add another arm to account for Cahill’s absence. It’s possible, though, that he’ll be given a chance to stake a claim to the job in center. The club has received middling production from Matt Joyce and Stephen Piscotty thus far and does not have a true center fielder on the roster. While Mark Canha has hit well since stepping in up the middle, and the A’s have a bevy of outfield-capable options, there’s a path to playing time for Fowler if the club so chooses. As for Cahill, he has been diagnosed with an elbow impingement. It’s not clear at the moment how long he will be expected to miss. He had been off to an excellent start after signing with Oakland for $1.5MM late in camp. Cahill has worked to a 2.25 ERA with 11.6 K/9 against 2.3 BB/9 over 24 frames in four outings. Filling the void could mean bringing back Kendall Graveman, but his struggles have persisted since his demotion. Otherwise, Frankie Montas and Daniel Gossett appear to be the top options on the 40-man roster. Jeff Fletcher of the Orange County Register runs through a number of factors that could contribute to the remarkable discrepancy between Shohei Ohtani’s uninspiring spring performance and his dominance on both sides of the ball during the regular season. Meanwhile, Ken Rosenthal of The Athletic highlights (subscription link) Ohtani’s ravenous consumption of data and analytics that the Angels are providing him and his ability to make unnaturally quick adjustments. Veterans Ian Kinsler and Chris Young marveled to both Fletcher and Rosenthal about Ohtani’s work ethic and adaptability, while hitting coach Eric Hinske praised his willingness to ditch a leg kick he had long utilized at the plate in an effort to make his swing more efficient. Pitching coach Charles Nagy and catcher Martin Maldonado also weighed in on the way in which Ohtani has quickly adapted to his new environs while taking MLB by storm. Jurickson Profar exited Monday night’s game after a rough landing upon being upended by a sliding Mallex Smith at second base and is currently in MLB’s concussion protocol, as Gerry Fraley of the Dallas Morning News writes. Even a short-term absence for Profar would further devastate the Rangers’ middle infield depth, as both Rougned Odor and Elvis Andrus are currently on the shelf. As Fraley points out, Eliezer Alvarez is the only middle infielder in the minors that’s on Texas’ 40-man roster, but he’s primarily a second baseman. Hanser Alberto could see his contract selected if Profar needs to go on the disabled list, though that’d require a corresponding 40-man move. Andrus is the only player who presently stands out as a potential 60-day DL candidate to make that move, but the initial prognosis on him called for a recovery of six to eight weeks. If the Rangers are optimistic that he can return on the shorter end of that window, they won’t want to lock him into a 60-day absence, creating the possibility that they’ll need to designate someone for assignment. The Athletics will call on right-hander Trevor Cahill to take the ball in tonight’s game against the White Sox, as MLB.com’s Jane Lee writes. Oakland brought Cahill back to the organization on a one-year, $1.5MM deal late in Spring Training after it was learned that young righty Jharel Cotton would require Tommy John surgery. 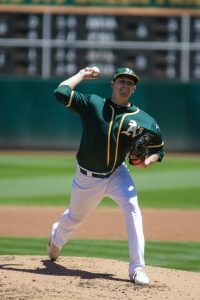 The veteran Cahill, who broke into the Majors with the A’s back in 2009, has made a pair of starts in the minors as he builds up arm strength and tossed 83 pitches in his most recent outing, Lee notes. Manager Bob Melvin said that the right-hander might be able to go a bit longer than that this time out, though it obviously Cahill’s performance will dictate what type of leash he’s given. The Mariners are facing a significant number of roster decisions in the coming days, beginning with the debate over how to clear space on the 25-man roster for fifth starter Ariel Miranda tonight, writes Greg Johns of MLB.com. Seattle also needs to find space to activate Ben Gamel from the disabled list, as he’s now played nine games on his minor league rehab assignment and is largely ready for big league activity. But Gamel’s return presents its own set of issues, as the club will face a decision on struggling 44-year-old Ichiro Suzuki. As Johns examines at much greater length, the team essentially needs to determine whether it’s best to move forth with a seven- or eight-man bullpen while also clearing space for a few returning regulars and making some sort of determination on Ichiro. MONDAY: Cahill will earn $1.5MM, per Jon Heyman of Fan Rag (via Twitter). SATURDAY: The Athletics have agreed to a one-year, major league contract, pending a physical, with right-hander Trevor Cahill, Jane Lee of MLB.com tweets. Susan Slusser of the San Francisco Chronicle reported earlier Saturday that Oakland could target Cahill, a client of John Boggs & Associates. With righty Jharel Cotton set to undergo Tommy John surgery and miss the entire season, the Athletics found themselves seeking starting depth on Saturday. Cahill will provide that, and he’ll attempt to grab a spot in an Oakland rotation that lacks certainty beyond Kendall Graveman and Sean Manaea. High-end prospect A.J. Puk seems unlikely to begin the year in the majors, leaving the A’s with Cahill, Paul Blackburn, Andrew Triggs, Daniel Mengden and Daniel Gossett vying for the final three spots in their rotation (depth chart). This deal represents a homecoming for Cahill, a California native whom the Athletics chose in the second round of the 2006 draft and who began his career as an eminently effective starter for the club. Cahill spent 2009-11 in Oakland, where he ate 583 innings and pitched to a solid 3.91 ERA, despite less-than-stellar strikeout and walk numbers (5.48 K/9, 3.35 BB/9). The A’s then shipped him to Arizona in a five-player, December 2011 trade that brought them righty Jarrod Parker, among others. Injuries have since ended Parker’s career, while Cahill has seen his effectiveness wane dating back to the end of his first Oakland stint. The 30-year-old Cahill started 30-plus games and racked up between 178 2/3 and 207 2/3 innings in each of his first four seasons, but he hasn’t approached those figures since. He’s only a couple years removed from essentially working as a full-time reliever with both the Braves and Cubs, but he primarily functioned as a starter in 2017. Across 21 appearances (14 starts) and 84 frames between San Diego and Kansas City, Cahill posted a 4.93 ERA/5.28 FIP and logged 9.32 K/9 against 4.82 BB/9. He also registered an impressive 55.6 percent groundball rate (right in line with his career mark of 55.1). Unfortunately, though, shoulder issues helped derail his season after the Royals acquired him in July. While Cahill managed outstanding numbers over 61 innings with the Padres (3.69 ERA, 10.6 K/9, 3.5 BB/9), he offset those by surrendering 21 earned runs on 33 hits and 21 walks, with 15 strikeouts, during his 23-frame Royals tenure. Cahill was on the disabled list three times with shoulder and back problems during his two-team run in 2017, surely helping lead to his inability to find a job from November until now. The A’s, on the heels of the promising Cotton’s injury, are left to hope Cahill will more closely resemble the version who held his own with the Padres than the one who scuffled with the Royals.